May 5, 2011 - The first batch of the 20 orders of Boeing 787 Dreamliner by the national airline of Singapore will no longer be expected this year as originally scheduled due to the manufacturer’s production technicalities. Deployment of the 20 Airbus A350-900 XWB aircrafts was likewise postponed to 2013 instead of next year, according to the management of Singapore Airlines (SIA). “We remain in talks with Boeing on revisions to the delivery schedule for the B787-9s. We can confirm that our first 787 delivery will not be in 2011,” SIA Vice President for Public Affairs Nicholas Ionides told Singapore Business Review. “The Airbus A350 XWB-900s, [meanwhile] of which SIA has 20 on firm order, are scheduled for delivery starting from FY2013/2014,” he added. Boeing was rolled out in 2007 in the global market. The entry into service date, initially planned for 2010 however was postponed to 2013 as the aircraft manufacturer publicly admitted difficulties in completing the production process. Boeing 787-9s has a ‘stretched fuselage’ and will seat 250-290 passengers with a range of 8,000 to 8,500 nm (14,800 to 15,750 km). Like other previous variant, the Dreamliner brings the economics of large jet transports to the middle of the market, using 20 percent less fuel than any other airplanes of their size. The delay of Airbus’ another aircraft variant A380 meanwhile put brakes on A350 XWB formal launch, supposedly from 2010 to 2012. As a result, delivery to airlines which made orders of the extra-wide-bodied aircraft to Airbus was also delayed. The scheduled delivery to Singapore was shifted to 2013 from 2012. Airbus boasts that it brings together the very latest in aerodynamics, design and advanced technologies in the A350 XWB to provide a 25 per cent step-change in fuel efficiency compared to its current long-range competitor. SIA’s upgrading of aircrafts is in line with its thrust to improve its productivity to remain at par with other international airlines. “We pursue a long-term strategy of maintaining a young and modern fleet, to take advantage of the new technologies offered by manufacturers which offer greater fuel efficiency,” Mr. Ionides said. Already, SIA is the first airline in the world to operate the Airbus A380, which offers the lowest fuel burn per seat mile of any aircraft currently available. SIA will operate the Airbus A380 superjumbo on the Singapore-Tokyo Narita-Los Angeles route from July 1, 2011. The Airbus A380 is a double-deck, wide-body, four-engine airliner powered by a liquid fuel processed from gas, GTL (Gas to Liquids), under the company’s alternative fuel research program. One engine was fuelled with a blend of 40% GTL and standard jet fuel, the other three with standard fuel. 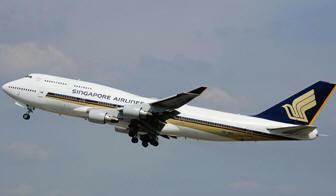 Singapore Airlines is the flag carrier of Singapore. Singapore Airlines operates a hub at Changi Airport and has a strong presence in the Southeast Asia, East Asia, South Asia, and "Kangaroo Route" markets. The company also operates trans-Pacific flights, including the world's two longest non-stop commercial flights from Singapore to Newark and Los Angeles.